Kim Jae-hoon, Kim Do-yeon rank high on the APM ranking. March. 21, 2018 07:56. by Jong-Koo Yang yjongk@donga.com. Kim Jae-hoon (29) and Kim Do-yeon (25), who came first among Korean marathoners in the men’s and women’s race, respectively, at the 2018 Seoul International Marathon and the 89th Dong-A Marathon, have also ranked high on the Asian Premier Marathons (APM) ranking. The Seoul International Marathon is a competition held in Korea along with the Beijing Marathon and Beirut Marathon as part of the APM. The APM was established in September last year, modeling after the World Marathon Majors, which consists of New York, London, Berlin and Tokyo Marathons, to enhance performance of Asian marathoners. Athletes participating in two or more than APM marathons earn points according to the competition results, and the top three Asian men and women rankers of the APM ranking are awarded with prize money. 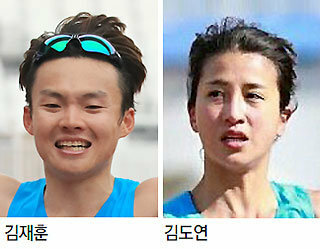 Kim Jae-hoon and Kim Do-yeon finished first among Korean marathoners at the Seoul International Marathon with the record of 2:13:24 and 2:25:41, respectively. They each earned 19 points, which are the best record aside from African marathoners. Kim Jae-hoon ranked at second in the APM ranking following Li Zicheng, who earned 38 points after finishing first among Asian marathoners in the Beijing Marathons (2:17:36) and Beirut Marathons (2:18:29) in 2017. Kim Do-yeon ranked third in the APM ranking by earning 38 points after finishing first among Asian marathoners in the Beijing Marathons (2:42:53) and the Beirut Marathons (2:57:28). China's Hurin Lee ranked first with 38 points and Gong Lihua, who finished second earning 24 points at the 2017 Beijing Marathon (2:46:56) and at the 2018 Seoul International Marathon (2:31:05), ranked second. The Beijing Marathon, which is held in every September, is the last race of the first APM series.